Parents "relieved" by coroner's ruling that dingo took baby, want to put "daughter's spirit to rest"
(CBS/AP) CANBERRA, Australia - Thirty-two years after a 9-week-old infant vanished from an Outback campsite in a case that bitterly divided Australians and inspired a Meryl Streep film, the nation - and the baby's parents - overwhelmingly welcomed a ruling that finally closed the mystery. A coroner in the northern city of Darwin concluded Tuesday that a dingo, or wild dog, had taken Azaria Chamberlain from her parents' tent near Ayers Rock, the red monolith in the Australian desert now known by its Aboriginal name Uluru. 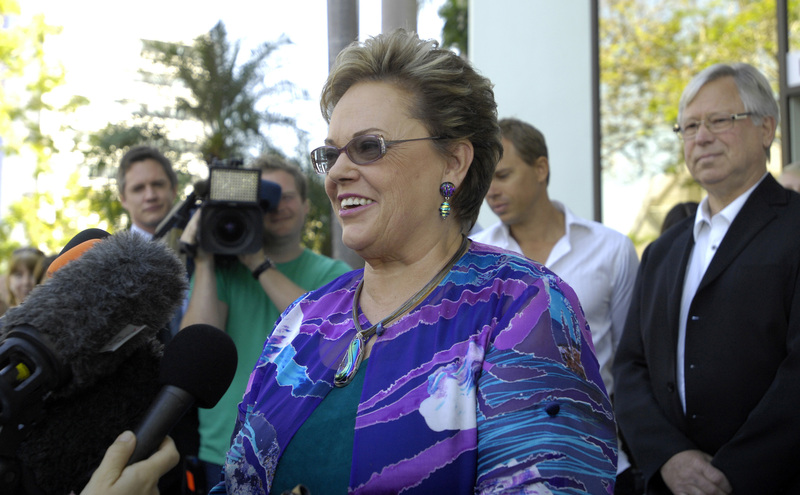 That is what her parents, Lindy Chamberlain-Creighton and Michael Chamberlain, had maintained from the beginning. The eyes of the parents welled with tears as the findings of the fourth inquest into their daughter's disappearance were announced, watched by people around Australia on live television. "We're relieved and delighted to come to the end of this saga," a tearful but smiling Chamberlain-Creighton, since divorced and remarried, told reporters outside the court. The first inquest in 1981 had also blamed a dingo. But a second inquest a year later charged Chamberlain-Creighton with murder and her husband with being an accessory after the fact. She was convicted and served more than three years in prison before that decision was overturned. A third inquest in 1995 left the cause of death open. "The dingo has done it. I'm absolutely thrilled to bits," said Yvonne Cain, one of the 12 jurors in the 1982 trial that convicted a then-pregnant Chamberlain-Creighton of murder. "I'd always had my doubts and have become certain she's innocent." Cain said she still encounters people who doubt the couple's innocence, but they inevitably misunderstand what evidence there was against them. "When people say she's guilty, I say: `You have no idea what they're talking about  I was there,"' she said. The case became famous internationally through the 1988 movie "A Cry in the Dark," which Streep played the mother. Many Australians initially did not believe that a dingo was strong enough to take away the baby, whose body has never been recovered. Public opinion swayed harshly against the couple; some even spat on Chamberlain-Creighton and howled like dingoes outside her house. No similar dingo attack had been documented at the time, but in recent years the wild dogs native to Australia have been blamed for three fatal attacks on children. Few doubt the couple's story today, but the latest inquest  which the family had fought to get  made it official that Azaria was killed in a dingo attack. An expert on dingo behavior, Brad Purcell, said he was not surprised that a dingo would enter a tent and take a baby while older siblings slept. Purcell suspects that many people blamed Chamberlain-Creighton for leaving the baby in a tent where a dingo could have been attracted by her crying. "She was almost being condemned because she wasn't acting as a responsible parent," Purcell told Australian Broadcasting Corp. But not all Australians accept the latest ruling. A policeman who was at Uluru the night Azaria disappeared said he still believes the first coroner's finding that there was some human intervention. Frank Morris, who has since retired from the police force, said while he was not trying to blame the parents, he thought someone played a part in moving clothing Azaria wore that night. "We don't know who. That is the $64,000 question," Morris said. "If you go to court enough times, you are bound to get a win sooner or later," Morris added of the parents' victory Tuesday. The parents and the eldest of their three surviving children, Aiden Chamberlain, 38, on Tuesday collected Azaria's new death certificate. The son made national news in 2006 when he used as his wedding car the same yellow sedan that took the family to Uluru in 1980 and that a forensic scientist wrongly determined was spattered with an infant's blood. Years later, more sophisticated tests determined the "blood" was a combination of spilled milk and a chemical sprayed during manufacture under the car's dashboard. "We're relieved and delighted to come to the end of this saga," a tearful but smiling Chamberlain-Creighton told reporters outside the court. She later said she was undecided whether the coroner's finding was a cause for celebration. "I celebrate the final triumph of truth, but I don't celebrate her death and the two are so intertwined  I have no idea what I feel about that," she told Nine Network television in a paid exclusive interview. Coroner Elizabeth Morris said she was "satisfied that the evidence is sufficiently adequate, clear, cogent and exact and that the evidence excludes all other reasonable possibilities." The findings mirror those of the first coroner's inquest in 1981. But that inquest found that somebody had later interfered with Azaria's clothing, which was later found relatively unscathed in the desert. A second coroner's inquest triggered a Northern Territory Supreme Court trial that resulted in Chamberlain-Creighton being found guilty of slashing her daughter's throat and making it look like a dingo attack. She was convicted in 1982 and sentenced to life in prison with hard labor. She was released in 1986 after evidence was found that backed up her version of events: the baby's jacket, found near a dingo den, which helped explain the condition of the rest of the baby's clothing. A Royal Commission, the highest form of investigation in Australia, debunked much of the forensic evidence used at her trial and her conviction was overturned. Morris, the coroner, noted that dingo experts disagree on whether a dingo could have removed the clothing so neatly and without causing more damage. "It would have been very difficult for a dingo to have removed Azaria from her clothing without causing more damage than what was observed on it, however it would have been possible for it to have done so," she said. Michael Chamberlain had threatened to go the Northern Territory Supreme Court to force another inquest if Morris had not agreed to reopen the case. Another coroner had rejected his application in 2004 for a fourth inquest to challenge the 1995 finding. "This has been a terrifying battle, bitter at times, but now some healing and a chance to put our daughter's spirit to rest," Chamberlain told reporters. He said his quest for a death certificate that acknowledged his daughter had been killed by a dingo had seemed to be a "mission impossible." "However, I am here to tell you that you can get justice even when you think that all is lost. But truth must be on your side."